NASA's flagship mission for X-ray astronomy. A clump of material has been jettisoned from a double star system at incredibly high speeds. X-rays from Chandra reveal that a pulsar in orbit around a massive star punched through a circumstellar disk of material. Three Chandra observations of the system were taken between December 2011 and February 2014. The data suggest the clump may even be accelerating due to the pulsar's powerful winds. This trio of images contains evidence from NASA's Chandra X-ray Observatory that a clump of stellar material has been jettisoned away from a double star system at incredibly high speeds. This system, known as PSR B1259-63/LS 2883 – or B1259 for short – is comprised of two objects in orbit around one another. The first is a star about 30 times as massive as the Sun that has a disk of material swirling around it. The other is a pulsar, an ultra-dense neutron star left behind when an even more massive star underwent a supernova explosion. Researchers think that the pulsar knocked out the chunk of debris, which spans over a hundred times the size of the Solar System, when it collided with the disk around the massive star while traveling in its elliptical orbit lasting 41 months. 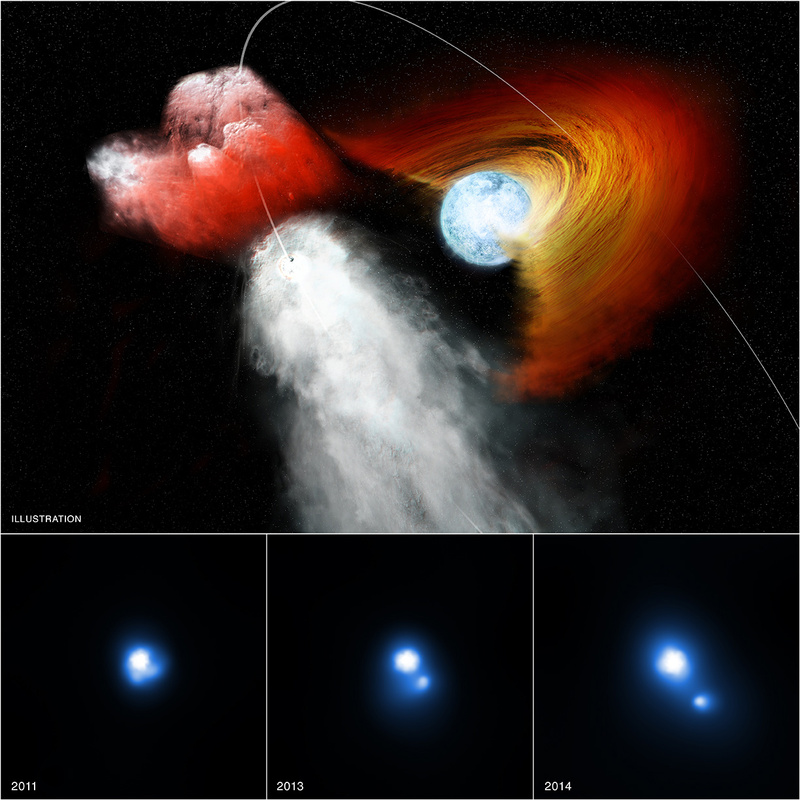 (An artist's illustration shows the pulsar just after having collided with the disk.) Astronomers came to this conclusion after analyzing three separate Chandra observations taken between December 2011 and February 2014, as labeled in the three images. The bright source in the center of these images is the binary system, while the smaller point-like source to the lower right seen in the second two observations is the clump that has been dislodged. The Chandra observations also suggest that the clump is not only moving quickly but may, in fact, be picking up speed. The average of the three observations shows the clump is moving about 7% the speed of light, but the data suggest it may have accelerated to 15% the speed of light between the second and third observations. This acceleration could be due to intense winds flowing off of the pulsar's surface at nearly the speed of light, which are caused by its rapid rotation and strong magnetic fields. The X-ray emission observed by Chandra is likely produced by a shock wave created as the pulsar's wind rams into the clump of material. The ram pressure generated by this interaction could also accelerate the clump. Chandra will continue monitoring B1259 and its moving clump with observations scheduled for later this year and in 2016. These results appeared in the June 20, 2015 issue of The Astrophysical Journal and are available online. The authors of this paper are George Pavlov (Penn State University), Jeremy Hare (George Washington University), Oleg Kargaltsev (George Washington University), Blagory Rangelov (George Washington University), and Martin Durant (University of Florida). NASA's Marshall Space Flight Center in Huntsville, Alabama, manages the Chandra program for NASA's Science Mission Directorate in Washington. The Smithsonian Astrophysical Observatory in Cambridge, Massachusetts, controls Chandra's science and flight operations. Coordinates (J2000) RA 13 02 47.60 | Dec -63° 50´ 08.70"
I feel it's so difficult to understand, if this can change to Chinese will be better. My English is poor. If the neutron star has a period of 41 months why has it not disturbed the decretion disc on previous orbits, giving rise to earlier ejection? This didn't tell me much information that I was actually looking for. I was hoping that this article would have went into more detail about this neutron star and this other host star colliding and ejecting some mass amount of stellar debris into space. I love reading ALL articles of the Chandra observatory and the Hubble space telescope, I am a huge fan of cosmology, astronomy, physics, etc I just wished they had released more information on this article than what NASA actually released. I know they have more info than what they actually released. Does this impose any threat to us on earth? X-rays from the Chandra X-ray Observatory. About 40 arcsec across (1.3 light years). How Far Away is it? What do the Colors Mean? This site was developed with funding from NASA under contract NAS8-03060.